A few days ago, on the 4th of July, the opening of the art exhibition “Rizes – Roots” by painter Irini Vazoukou took place. It is the artist’s 11th solo exhibition and is housed in Hydra’s Historic Archives and Museum. This new section includes 70 works of art of various sizes, on which the artist has been working for five years and it’s the first time they are all displayed in an exhibition room. The exhibition will be held until the 31st of July and is open every day from 9.00 to 16.00 and from 19.30 to 21.30. At the same time the Museum is also hosting Pavlos Samiou’s exhibition “Sea everywhere” until the 31st of July. “Art is love”: That is what Irini Vazouka strongly believes. Today we are very glad to be hosting here in our island, Hydra, in our exhibition room, the impressive collection “Rizes – Roots”, displayed for the first time, by the quite famous painter and my friend from Rhodes, Irini Vazouka. It is actually the artist’s latest work displayed for the first time as a whole and consists of 70 artworks made with varnish, acrylic colours and ink on canvas. As we can see, most of her artworks are big and are not exactly what we would call a usual summer collection, like for instance landscapes with vivid colours and visual descriptions, but depict the artist’s deep philosophical opinion and view on human essence. They are impressive, not only for their size but also for their theme and will definitely guide the viewer through new paths of aesthetic perception and deeper thinking. Plato’s philosophical theory – in his work “Republic” – about the river “Amelitas” (an imaginary river of the Underworld where souls go to drink water trying to come back to the world of the living) inspired the artist along with the things she has experienced in her life, which, as she states, have turned into roots and are “the link between the worldly and the unknown”. This artistic view is indeed an interesting aspect of Irini Vazoukou’s life, who’s displaying a different, special world by inciting her deepest thoughts and giving them life through her “Rizes – Roots” collection. This world is earthy and surrendered to the ravages of daily routine, but at the same time it is transmuted into a timeless reality full of essential light, chromatic harmony and disarming simplicity. Her art – that is undoubtedly anthropocentric even in this thematic, with the humans being food for her imagination and the human figure being present either in a visible or in a discrete way – captures her narrative compositions in a characteristic personal style. 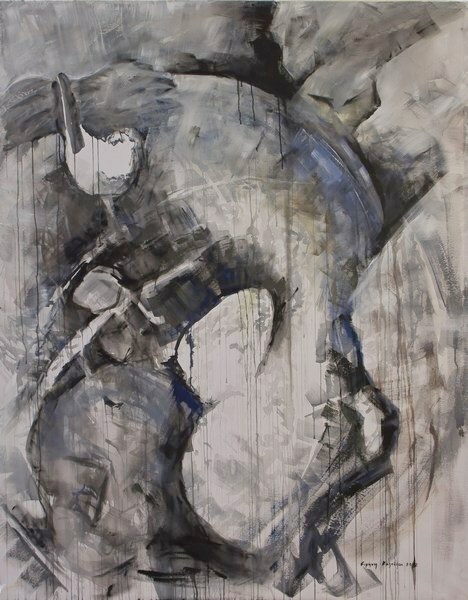 Through their eminent expressive intensity, the human figures in Vazoukou’s artwork seem like they’re always conversing with the past, but in the end of their artistic journey they’re communicating with the present. Irini Vazoukou is after all a modern Greek painter that can really fill our souls with art, culture and sensitivity colours just by using her brush. Thanks to her and her artwork, we will be able to embark on an extraordinarily beautiful journey for as long as the exhibition will be hosted here. So let’s enjoy her work and wish our dear friend a constantly rising artistic career. Irini Vazoukou was born in Rhodes, Greece. She has displayed her artwork in 11 solo exhibitions and has participated in more than 70 group exhibitions in Greece, Cyprus, Denmark and Finland. Some of her artworks are displayed in collections in the Modern Greek Art Museum in Rhodes, in the Municipal Art Gallery of Chania, in the Municipal Art Gallery of Corfu, in Hydra’s Historic Archives and Museum, in the Contemporary Art Museum “Eleourgio” in Chania, in the “Vafopoulio” Cultural Center of Thessaloniki, in Belleartelamia, in ETAL S.A. (Lesvos’ Local Culture Development Company), in the Ministry of Justice, in the Municipality of Rhodes, in the South Aegean District, in the Medical Association of Rhodes and in many personal collection in Greece and other countries. Her work has been mentioned by: Harris Kampouridis, art critic and communicator and member of the Academia Europaea, Elli Kokkini, art historian and head of the “Vafopoulio” Cultural Center of Thessaloniki, Poly Chatzimarkou, art & design historian and Europologist and also used to be in charge of the Modern Greek Art Museum in Rhodes, Maria Melenti, art historian and director of the Municipal Art Gallery of Corfu, Sasha Metallinou – Chaitow, Dr in Art History and Philosophy in the University of Essex, Dina Adamopoulou, Head of the States General Archives and Director of Hydra’s Museum. Painting, designing, sculpture, art history and architectural design studies in seminars and workshops during her artistic career. Some of the art teachers whose classes in painting, sculpture, art history and design she has taken: Chronis Botsoglou, Panagiotis Gravalos, Eva Kefala, Antonis Kafasis, and a painting Masterclass with Yiannis Ziogas. Sculpture with Thodoros (Thodoras Papadimitriou) and art history with Harris Kampouridis and poly Chatzimarkou. 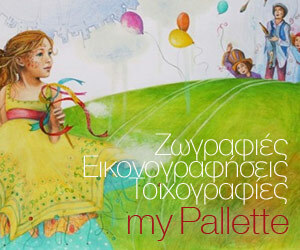 In 2011 she won the 1st Greek Award for painting by the Visual Artist’s Association of Northern Greece in Thessaloniki.